Dr. Reddi is a clinical instructor at the UW department of anatomic pathology. She is part of the subspecialty surgical pathology sign out teams. Dr. Reddi is also part of surgical pathology sign out team at Puget Sound VA Health Care system on a fee basis. 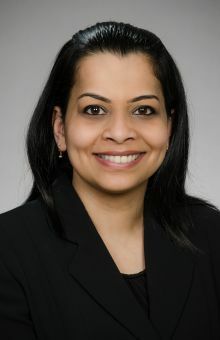 Dr. Reddi’s current research interests are centered in: Immunoglobulin G4 (IgG4) positive plasma cells in chronic liver disease and follicular lymphoma with marginal zone differentiation. Dr. Reddi’s previous research areas include: (1) myeloid neoplasms secondary to plasma cell myeloma therapy; (2) IgG4-related disease and scleroderma; (3) composite B-cell and T-cell lymphoid neoplasms; (4) extramedullary tumors after bone marrow stem cell transplantation. She was selected as Howard Hughes medical intern to conduct research on p63 isoform, ΔNp63α and squamous cell carcinoma at the National Institute of Health.